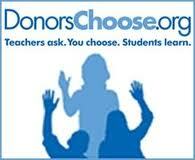 Have you ever considered setting up a DonorsChoose.org account? I have submitted four projects over the past two years and three of them have been funded! It is a wonderful way to ask for some of the larger items that I will never be able to afford for my class that make a huge impact. Have you ever noticed that classroom furniture and supplies seem to double in price once you add the word "school" or "classroom" to the description? Eeek! Note: I don't use Big Books in 3rd grade BUT I actually prefer the shorter chart paper, so this setup works perfectly. The best news is that this combo is full of storage and actually takes up less space than a larger chart/easel stand :) Something to think about if you don't have the space like I do for one of those big guys! Companies often run matching grants for donations- once, even Groupon had a deal where you spent $10 and received a $50 DonorsChoose.org credit! There is sometimes even a 1:1 donation out there from a larger company, so keep your eyes peeled for those match codes! It is very low-impact for the teacher- I have written grants asking for less money that have taken up more time and energy than DC's process. DC.org does a great job of keeping things simple and easy to understand. They provide email updates about your thank-you package due dates and that is very helpful for forgetful me! It doesn't take long to accrue points that can then allow you to ask for big ticket items. Their vendors sell EVERYTHING, so chances are, if it's out there, DC can fund it. You can receive donations from anyone- I have received countless funds from people I don't even know and that is so amazing to think about. It really does make a huge impact on my kids and I to know that total strangers want us to have better materials and a better learning environment. Very cool! As a teacher and new mom, it is becoming harder and harder to afford big classroom purchases, so I highly recommend taking a look over at DonorsChoose.org to see how they can help you and your kids!